Big Buddha peaking out to say hello to tourists on the Ngong Ping Cable Car. Get the crystal cabin round trip! 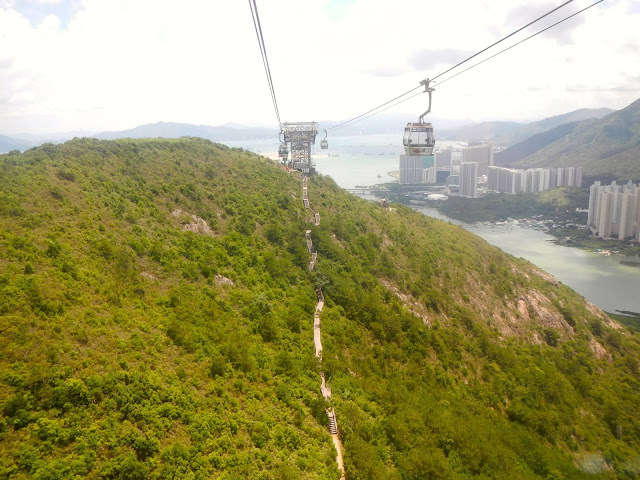 Floating high above the blue waters and greenery of Lantau Island, you will want to take in the full view with a glass bottom cable car. 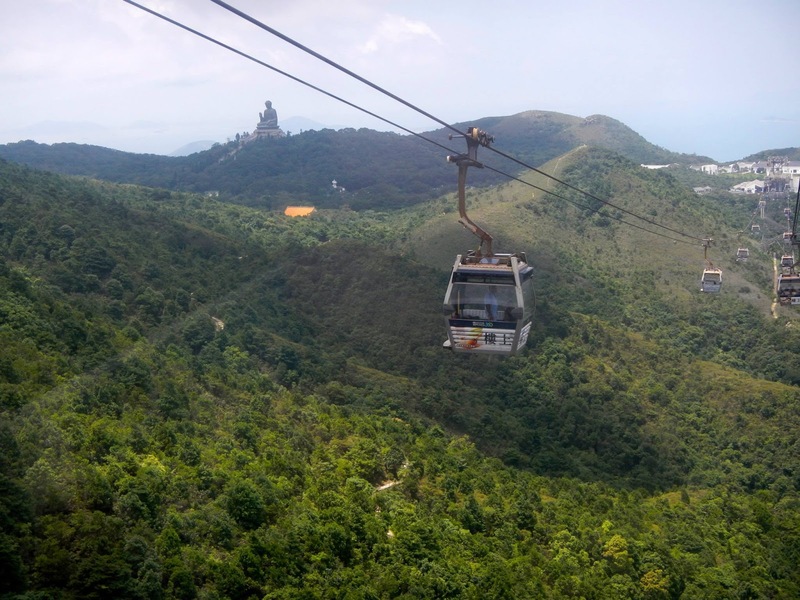 The 25 minute ride is worth every cent, as you take in the breathtaking views of waterfalls and hikers making their way up to see the Big Buddha. When you first spot him and Po Lin Monastery towards the end of the journey, you will be stunned. This is one of those tourist attractions that you MUST DO! The actual cable car fits about 8 people comfortably--four on each side. When you are standing in line, make sure that you are not next to anyone that might ruin your trip. Keep in mind that you will be with them for 25 minutes in the car. You don't want to ride along with those that may have forgotten their deodorant or might look weary of heights. If you are there in the summer, it is going to be insanely hot. Make sure to bring tons of water while you are waiting in line. If you buy the crystal cabin then the line will be a bit shorter since you pay more. A round trip is $165 ($21 USD) for a standard cabin and $255 ( $32 USD) for a crystal cabin, not that big of a difference unless you are penny pinching. I'd say its worth the extra $11 to get it both ways. I don't recommend buying any of the tour packages that include a trip to Tai O. The 360 Sky-Land-Sea Day Pass will load you on to a crowded bus back down the mountain on a windy road that will make you lose your lunch. Tao O is a little fishing village. Its cool if you want to go explore and have no expectations, but it is just another fishing town in Hong Kong with shops selling a bunch of fish products and little sea food restaurants. Plus, I've seen a few bad reviews of the Tai O excursion online reporting that although they were able to see a few pink dolphins, the trip was rushed and the boat drivers were not very friendly (which doesn't surprise me). You will probably be exhausted from walking around at the Buddha and Monastery, so I'd say skip the package and just pay for a round trip cable ride.